Supports bone health and immune system function while promoting nutrient absorption. Researchers suggest that many people are not getting the amount of vitamin D they need to support optimum health. NuMedica Micellized D3 + K2 improves the solubility of vitamin B as well as its absorption. This improvement means that more vitamin D is available to the parts of your body that need it. As nutritionists report, vitamin D3 is an important one for your body. The body, of course, does have the ability to make this essential vitamin; however, if you aren't getting out into the sunlight regularly-and with concerns about skin cancer, there is some reason to avoid too much sun time-your body can't make this vitamin. A supplement like NuMedica Micellized D3 + K2 fills in to provide you with the vitamin D3 you need whether you spend time in the sun or not. Modern medicine has been well aware that vitamin D is integral to bone health for about the last century. As more research about the vitamin was performed, researchers learned that vitamin D also supports immune health. It's important to think of vitamin D as an important facilitator of other vitamins. For instance, for your immune system to function properly, phosphorus and calcium need vitamin D to facilitate their absorption into the body. If you lack vitamin D, your immune system isn't likely getting the phosphorus and calcium it needs to support optimum health. 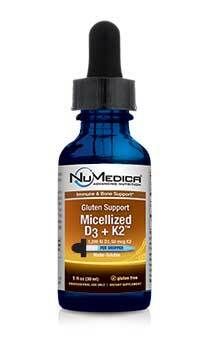 NuMedica Micellized D3 + K2 helps provide your body with the vitamin D it needs to foster good health. If you tend to spend little time outdoors and wear lots of sunscreen when you are or live in a city where buildings block sunlight, you could be at risk for vitamin D deficiency. Working indoors and pollution also detract from sunlight exposure. Although you can obtain vitamin D by spending time in the sunlight and eating fortified foods such as yogurt and milk, you may still need more vitamin D than these elements can provide. GS Micellized D3 + K2 - 1 fl. Oz. 20 Drops 30 Adults take one full dropper (20 drops) daily or as directed by your healthcare practitioner. Caution: Keep out of reach of children. Not recommended for children. Other Ingredients: Deionized water, ethoxylated castor oil, glycerin, natural flavor, citric acid, potassium sorbate, olive oil. †VitaMK7™ is trademarked by Gnosis S.p.A. Patent No. 7,718,407. Caution: Keep out of reach of children. Not recommended for children. So What's The Big Deal About Gluten? Is Gluten Bad? Gluten just is. The problem is, it generally is not being used in the correct proportions any more. 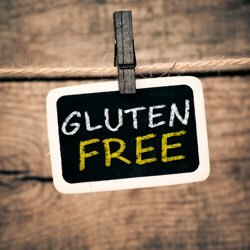 So let's take a moment to explore what gluten really is. Supports bone health and immune system function while promoting nutrient absorption with added Vitamin K2.